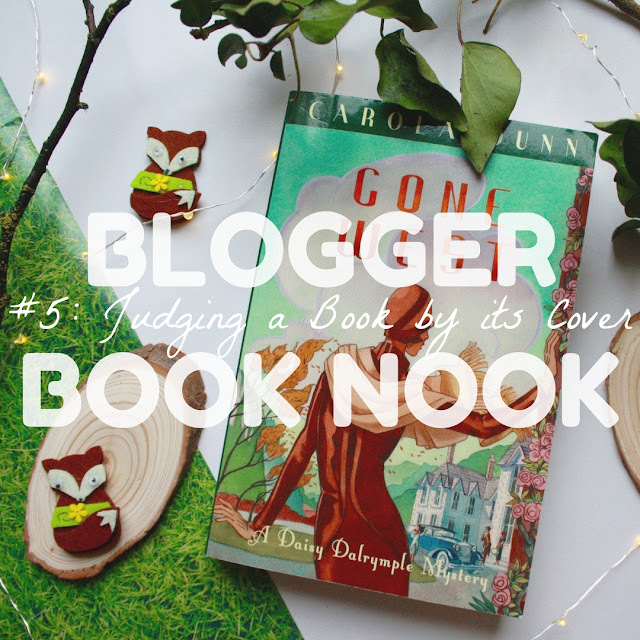 This month on the Blogger Book Nook, we're doing something a little bit daring. In fact, we're breaking one of the cardinal rules of reading and *gasp* ... judging a book by its cover. 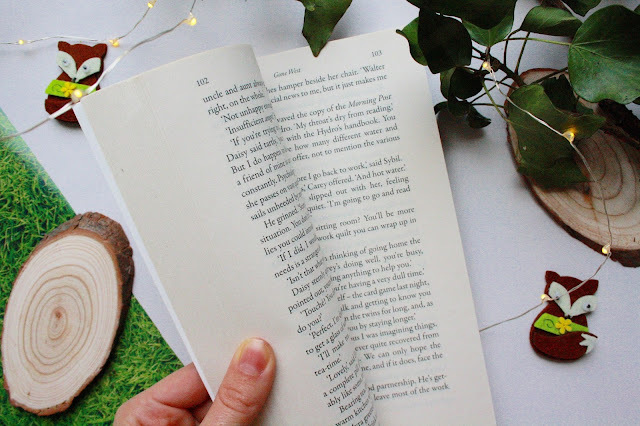 The old saying goes that you should never do this because you never know what will end up being hidden within the pages (literally or metaphorically), but in January, Tabitha and I have challenged our blogger book club to pick up a new book based just on the cover art and give it a go! Will we be pleasantly surprised? Or will we vow always to read the blurb in future? Let's find out! For those of you who don't know, the Blogger Book Nook is a friendly community of enthusiastic bloggers who all love to read! We have a Facebook group for regular discussions and sharing bookish blog posts - encouraging all members to keep up their reading motivation! A new reading prompt (such as this one!) is shared every month, with themes ranging from New Authors to Young Adult. Alongside the prompt comes a Q&A, should any members like to turn their month's read into a blog post. Keep scrolling to find my Q&A answers for January! 1) Which book currently on your shelf has the most beautiful cover? The book that I picked up for last month's reading prompt, The Snow Child, has an absolutely stunning cover! I love the simplicity of the white and dark blue, it creates a beautiful mood before the story even begins. 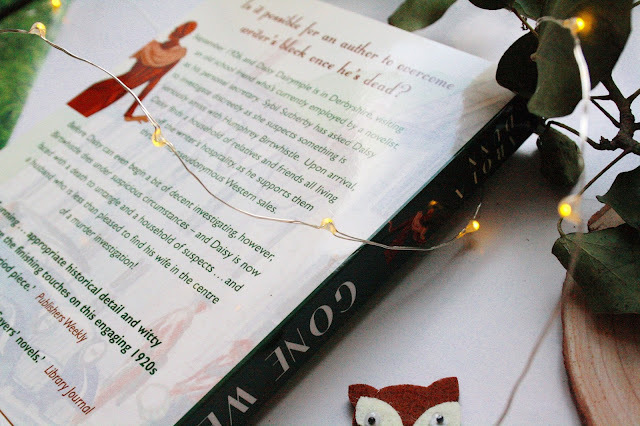 It also made photographing the book for the blog post extra enjoyable, which can never be a bad thing! 2) Is picking a book based on its cover something you do regularly? Nope, this month was a brand new experience for me! Usually, I read the blurb on the back of every book before I purchase a new read. Sometimes these blurbs can give a bit too much away and enable you to predict the ending before you even start reading, but on the other hand, they do give a good indication of whether the book is for you. While I don't think I'll stop reading the blurb on new titles entirely, this month's reading prompt has shown me that picking just based on the cover can produce interesting results, so I may give it a go again in future! 3) If a book was written about your life, what would be on the cover? This might seem a little random but hear me out, ok? I'd love to be represented in the centre of the cover, facing forward, with the scene split into two behind me. On one side, I'd be shown in the modern world, in my everyday clothing, probably cradling an armful of books in true PhD student fashion, perhaps with one of Oxford's grand old libraries behind me. On the other side, my clothing would be fit for an ancient Greek princess, wearing a peplos dress and a golden laurel wreath in my hair! Behind me I'd have a sprawling scene from ancient Athens! I think that this would really accurately represent my love of ancient history and how much it has shaped my life. #rambleover. 4) Do you prefer hardback or paperback covers? Why? I normally prefer paperbacks - I find that the dust jackets attached to many hardback books are so clumsy and get creased and bashed up so easily when reading. Paperbacks tend to be smaller and more comfortable to handle (and they're cheaper to buy! ), so I'd plump for one of those any day. 5) What draws you in most to a book cover? Stunning illustrations? Pretty lettering? Interesting textures? Beautiful textures always have an allure for me, I love textured lettering on the cover of a book, they make me want to pick it up and stroke it! (I can't be the only one!) A book with not just a gorgeous cover but interesting decoration along the spine is always a winner too! For this month's prompt, I headed to a local charity shop to find a book with an eyecatching cover. 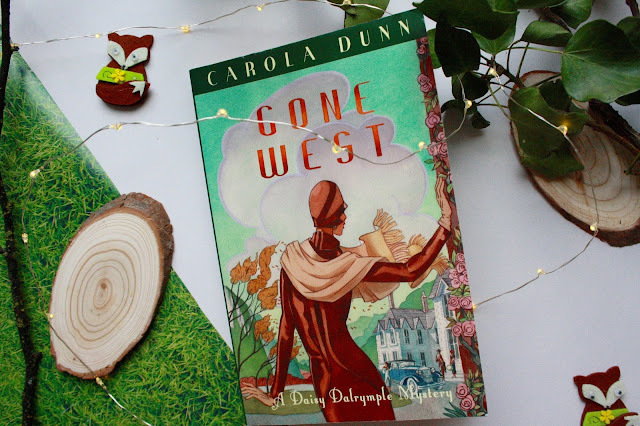 For the grand total of £1, I treated myself to a copy of Gone West by Carola Dunn. I chose this book because I am a huge fan of 1920's fashion, so the figure on the front cover really caught my eye in her gorgeous cloche hat and fitted dress! The cover had me hoping for a historical treat and I wasn't disappointed. I found out as I began reading that this book is actually the twentieth (!!) in a series about an amateur detective named Daisy Dalrymple, but the fact that I hadn't read any of the previous books didn't spoil my enjoyment of this one. The plot follows Daisy, who has quite the reputation for solving mysteries, as she is enlisted by Sybil, an old school friend, to investigate some strange goings on at her employer's country house. Sybil is working as a secretary for a famous author, Humphrey Birtwhistle, who is incapacitated due to a strange unknown illness. Sybil suspects foul play from one of his many relatives who live in the house, and her suspicions seem to be founded when Humphrey ends up dead! Daisy finds herself at the centre of a murder inquiry and she eventually manages to help unmask the criminal, but who was to blame? No spoilers here, you'll have to read for yourself! Overall, I did enjoy this read. I really liked the authentic 1920's setting and the fact that the mystery really kept you guessing until the last page - my theory on Who Dunnit changed several times over the course of the book so the ending certainly wasn't predictable. However, the stereotyping of some characters did grate on me a little. Humphrey Birtwhistle's niece Myra was very much a cardboard cutout as the airhead rich heiress. A large number of characters were also introduced at once, meaning that telling them apart and remembering who's who was quite difficult. Furthermore, the actual main event of the mystery (the murder) didn't take place until halfway through the book - I'm always game for ramping up the tension but I felt that the buildup here was just too long. I certainly found this book entertaining but probably wouldn't reach for it a second time. As always, a huge thank you goes out to everyone who published a Book Nook post for December's prompt, including Hels, Fleur, Zoe and Abbie! What have you been reading lately? Please share in the comments! Check out my January advertisers!